The country traditionally associated with coffee, crude oil, drug cartels and deep-seated internal conflict, Colombia is turning over a new leaf. Whether the change is happening by design or by default, it must be said that while some of the recent developments in Colombia are welcome, others are concerning. President Santos and his political allies have managed to create a constitutionally-binding peace process that legally brings to an end the 52-year conflict with the Marxist rebel groups operating in the country. Colombia’s parallel economy in which rebel groups collected war taxes, operated drug cartels and engaged in kidnapping and extortion, could also be drawing to a close. This positive development promises to mark a turning point in the country’s economic story. Nevertheless, the economy is facing tumultuous times: a historic collapse in the price of commodities, particularly oil, has shocked Colombia’s external sector, resulting in a weaker peso, a higher current account deficit and a dent in government revenue. More recently, inclement weather has affected agricultural output and raised food prices, which has forced the Central Bank to undergo a drastic tightening cycle in order to bring inflation back under control. These unprecedented factors are all impacting the economy in complex ways. 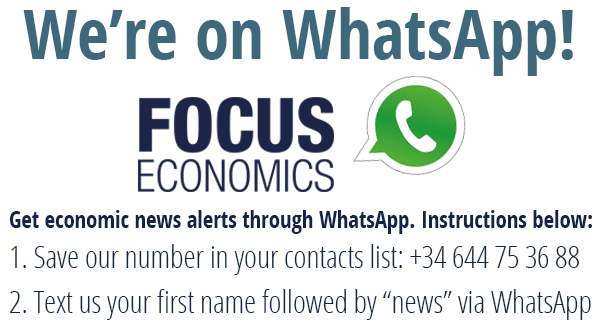 FocusEconomics consulted Nelson Vera, Macro-Chief Economist at the Asociación Nacional de Instituciones Financieras (ANIF) for additional insight into Colombia’s economic dynamics. ANIF is the winner of the FocusEconomic’s best overall forecaster award for Colombia this year. BanRep has stated that it aims to reduce inflation and ease the current account deficit by hiking rates. However, some people question the severity of the tightening cycle, suggesting that it may be an over-adjustment given that the high levels of inflation are due in part to transitory factors, such as the peso’s previous depreciation and the El Niño phenomenon. Do you feel that the Bank has over-adjusted and that the tightening cycle could end up impacting domestic demand more than originally intended? Vera: "Clearly those who criticize Banrep for hiking rates in the face of unanchored inflation expectations don’t understand the Inflation Targeting Framework under which our Central Bank operates. The repo hikes that Banrep has been enacting are more than warranted, seeing that inflation has not only surpassed the 8.6% mark in June, but that inflation expectations for end 2016 are in the range of 6–6.5% and near to 4% even at the end of 2017. We must be careful not to follow in Brazil’s footsteps, thinking that lower aggregate demand, FX pass-through or temporary climate factors will bypass the need for the central Bank to act. We all know the results in Brazil: 4% GDP contraction coupled with 10% inflation." Owing to a plunge in oil prices, Colombia registered a fiscal deficit equivalent to 3.0% of GDP in 2015. The government expects the fiscal deficit to widen to 3.9% in 2016 and to shrink to 3.3% of GDP in 2017. It is unclear where oil prices will end up leveling off, but the Consensus Forecast is at around USD 60 per barrel at the end of 2017. If this were the case, what would it mean for Colombia’s budget? Is this price still too low for Colombia to count on oil as a meaningful source of government revenue? Vera: "The recent Medium Term Fiscal Framework (MTFF, government data) takes into account a forecast for oil prices of around USD 42/barrel in 2016, which is in line with our forecasts. Having said that, the fiscal revenues pertaining to the oil and mining sector are not likely to return to their peak levels of 2.5% of GDP observed in 2013. If the oil price tends to stabilize in the neighborhood of USD 60 per barrel in the next 5 years, oil revenue could hover around 0.5-1% of GDP per year." The government has stated that tax reform is required to secure new revenue and help the country cope with the impact of low oil prices. Will the tax reform be able to replace oil revenue and stop the deficit from breaching the government’s targets? Are the government’s assumptions for GDP growth and new tax revenue sources too optimistic? Vera: "Precisely, the recent MTFF sees serious revenue gaps in the coming years in order to comply with the fiscal deficit targets. These shortfalls reach 3% of GDP in 2020 and almost 4% of GDP in 2022-2026. Note that those numbers are far greater than the 2% of GDP that even the most optimistic variant of a Structural Tax Reform can produce." Colombia has long been described as two countries in one: a modern economy in the urban areas with a relatively-well educated workforce, competitive infrastructure and a stable financial system, while in other parts of the country violence associated with drug cartels and rebel groups is still rampant. However, President Santos and the FARC have recently reached an agreement to end hostilities, and peace talks are about to start with other rebel groups. To what extent will the peace pact impact the regional discrepancies across the country? If it takes hold, can we expect areas once dominated by rebel groups to become more attractive to investors? Vera: "The subject of the “peace dividends” in Colombia has been a hotly debated issue in Colombia. In terms of growth, we don’t see our economy jumping to 5-5.5% GDP growth over the next five years, as some analysts claim, not least because the reversal in the commodities super-cycle has lowered our potential output from its historic value of 4.5% to 3.5%. At most, the peace process could add in the region of 0.3-0.5% of additional growth each year, but that will depend on the extent to which the government can increase regional infrastructure to elevate the productivity of those rural areas. "This all comes with the caveat that the National Liberation Army (ELN, the remaining guerrilla group) or the “BACRIM” (an umbrella term for different criminal groups) might fill the territories which are currently held by the FARC. This is a major reason why we don’t see any “dividend” in lower security spending either. Colombia currently spends around 3% of GDP on security-defense, 2% to the army, 1% to police. We may have to rebalance that spending to 1% army, 2% police in order to focus on urban violence." Latin America’s economy is expected to contract for a second consecutive year in 2016. A protracted recession in Brazil and Venezuela is dragging on the region’s growth and rising political risks in these countries are clouding the region’s outlook. How will these regional developments affect Colombia’s economy this year? Vera: "Colombia is greatly influenced by what happens to its major trading partners of the region, Ecuador and Venezuela. As these two countries face strong headwinds, Colombia will be affected via lower exports, which is precisely what has been happening in the last few years." Colombia has come a long way from where it was 17 years ago, when a poorly managed economy and a malfunctioning financial sector triggered a crisis that resulted in a recession, with GDP contracting 4.2% in 1999. The country has since developed a stable financial system, organized its government finances and transformed its economy, however, this will be tested by external challenges stemming from the oil price shock and high inflation. We polled 34 local and international analysts for their projections for this year and next. The panel of forecasters foresees GDP growth slowing from last year’s 3.1% to 2.3% this year. Colombia’s relatively solid economic foundations bode well for growth and should allow for a prompt recovery after this year’s expected deceleration. Analysts project the economy picking up next year and the Consensus Forecast is for 2.9% growth in 2017.